 MP3Search.Ru sells songs for $.10 a track (and offers 10 percent discounts for albums) as opposed to the standard set by iTunes of $.99 a song and $9.99 an album.  All the tracks are encoded as MP3 files—which means absolutely no DRM. The only Web sites that offer MP3 files are those with Indie artists, whereas iTunes (protected AAC) and others (secure Windows Media) use files with copy protection built-in. (There’s also no consistency to how the tracks are encoded, with some at 160kbps, some at 192kbps, and others with variable bit rate (VBR) encoding. 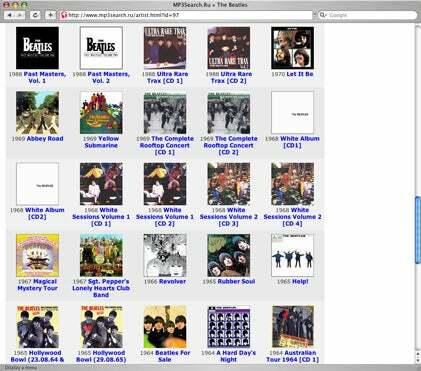  MP3Search.Ru has the Beatles. Nobody , not even Apple, has secured the rights to sell the Beatles as digital downloads.  The site sells “albums” that are clearly marked as bootlegs—illegal live recordings being sold without the knowledge or consent of artists. According to the legislation of Russian Federation, ROMS is entitled and obliged to operate in the name and in the interests of absolutely all rightsholders, both Russian and foreign. ROMS carries out its activity on the basis of the powers given directly by the Law, irrespective of the presence or absence of a contract with a rightsholder. Licenses given by ROMS “allow using of all works and objects of related rights only in the form provided by such licenses, and are given on behalf of all owners of copyright and related rights, including those who have not given their authority to the organization” (Section 2 of Article 45 of the Law of Russian Federation on Copyright and Related Rights). According to Section 2 of Clause 47 of the Law of Russian Federation on Copyright and Related Rights, any owner of copyright or related rights that had concluded an agreement with ROMS, has the right to demand due compensation according to the distribution performed by ROMS. So if I’m reading this correctly (and I’m surely no lawyer), Russian law allows for its citizens to make money from selling copyrighted works without requiring permission or even notification of the copyright owner? And a band has to request royalties if it wants to be paid? I decided to ask someone who works for the band Metallica—whose music is well-represented on MP3Search.Ru—to see whether they band receives any royalties from these sales. She said officially the response was “no comment,” but pointed out that Metallica only sells its music by album (not by track), which is why you won’t find Metallica on the iTunes Music Store. so obviously, this site just does whatever it wants. As disturbing as it sounds, what MP3Search.Ru does may actually be perfectly legal in Russia. But an important question is, is it legal in the United States? If I purchase music through the site, it’s with a U.S. credit card and a U.S. mailing address. (Interestingly, it uses a secure purchase form—complete with VeriSign logo—through a company in the Netherlands.) Would I be breaking the law if I purchased music from the site, just as if I bought prescription drugs over the Internet from another country (especially without a prescription)? For now, I’m sticking with the iTunes Music Store—and my local pharmacy.